You can create a treasured memory at the open-air bath where you can see a marvelous view from forty meters in the air! 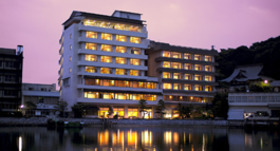 Kanzanji Sago Royal Hotel is a Japanese inn at a hot-spring resort surrounded by Mt. Tateyama that has Kanzanji temple, the origin of the name "Kanzanji Onsen". At Mt. Tateyama, there is a Kanzanji Sho Kanzeon Bosatsu Statue standing as if watching over the hotel, and you can walk to visit there. 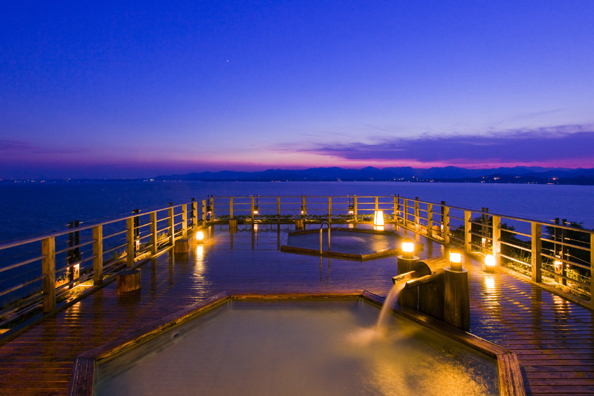 During evening twilight, you can enjoy the beautiful view of Lake Hamana which changes from moment to moment, from the open-air bath or the pool side. It's at a very magical location, and only a few minutes walk to the activity facilities such as Lake Hamana Sightseeing Cruiser boarding point. 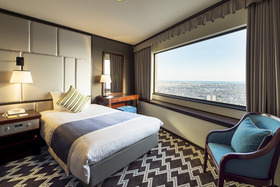 You can enjoy the scenery of the magnificent Lake Hamana from "the observation panoramic large public bath/ open-air bath" on the 10th floor of the hotel and "the open-air bath Hiten" on the roof 40 meters above the ground. 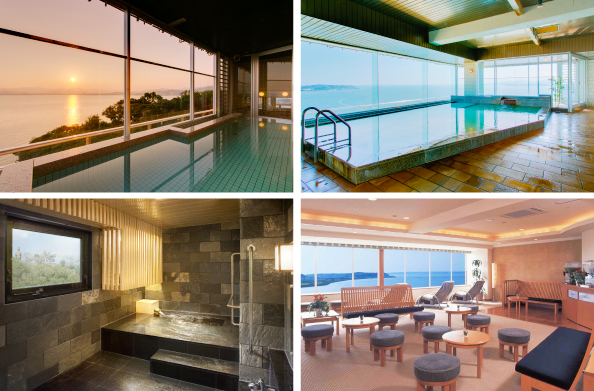 Also, you can enjoy an onsen in a private space at "Koyunoma". 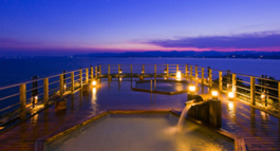 ※You can enjoy onsen on a day trip. At the popular buffet "Fujino-kuni Shizuoka Gourmet Biking", the theme changes a couple of times a year, and you can enjoy seasonal local foods of Shizuoka prefecture. There also are various set course in which you can enjoy local ingredients, such as natural tiger puffer. 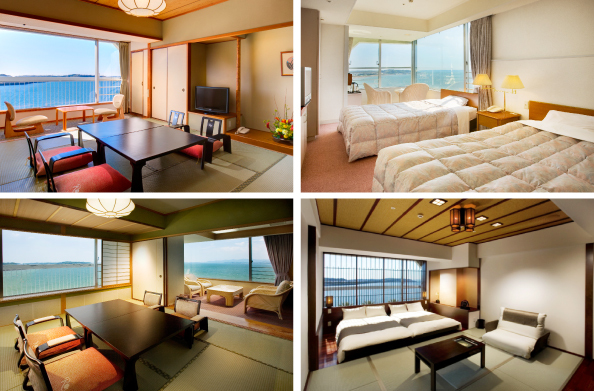 There are various guest rooms that can match your needs such as Japanese / Japanese-western style or western style, and you can view Lake Hamana from every room. The guest-only pool faces Lake Hamana where you can almost feel the unification of the sky and the lake, which is an open-air space. You can enjoy a completely different atomosphere at night because of their illumination. 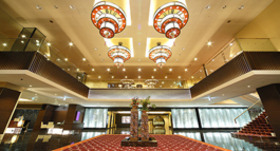 The shop inside the hotel is duty-free which is good for foreigners, and there are many local specialities. You can also enjoy walking the street of Kanzanji using the rental service of colorful yukatas only in summer. There is a board where you can check the sunset time of the day at the lobby so that you won't miss the marverous sunset. Also, "Kanzanji sun beach" which is only a minute walk from the hotel is popular sunset viewing spot for walking and you can enjoy swimmning there during summertime. ※There is a day or time you cannot go in depending on conditions. Language English-speaking staff and Chinese-speaking member are available. Internet Free Wi-Fi is available in the hotel lobby. 15 minutes from Tomei Expressway Hamamatsu Nishi I.C. 30 minutes from Tomei Expressway Mikkabi I.C.